Western blot analysis of extracts from various human cells using CRACC/SLAMF7/CD319 (E5C4M) Rabbit mAb (upper) and β-Actin (D6A8) Rabbit mAb #8457 (lower). 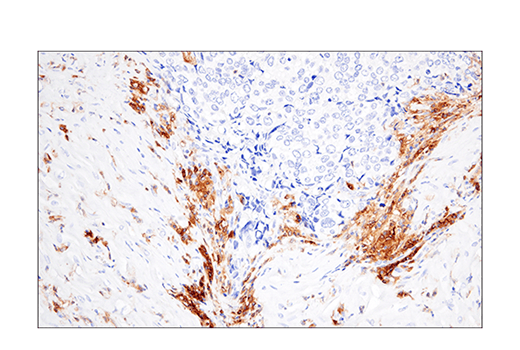 Immunohistochemical analysis of paraffin-embedded human lung adenocarcinoma using CRACC/SLAMF7/CD319 (E5C4M) Rabbit mAb performed on the Leica® BOND™ Rx. 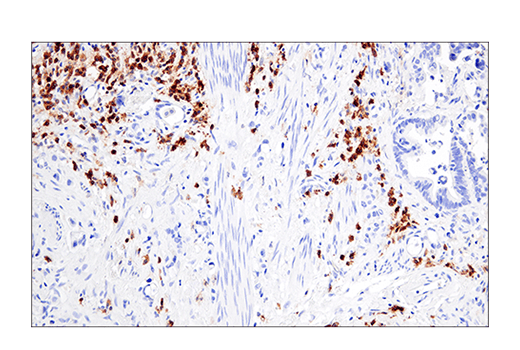 Immunohistochemical analysis of paraffin-embedded human urothelial carcinoma using CRACC/SLAMF7/CD319 (E5C4M) Rabbit mAb. 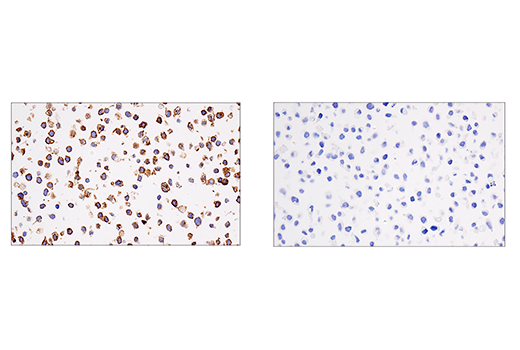 Immunohistochemical analysis of paraffin-embedded human multiple myeloma using CRACC/SLAMF7/CD319 (E5C4M) Rabbit mAb. Immunohistochemical analysis of paraffin-embedded IM-9 cell pellet (left, positive) or HeLa cell pellet (right, negative) using CRACC/SLAMF7/CD319 (E5C4M) Rabbit mAb. 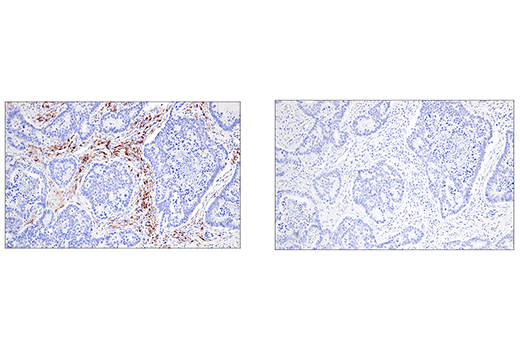 Immunohistochemical analysis of paraffin-embedded human colon carcinoma using CRACC/SLAMF7/CD319 (E5C4M) Rabbit mAb (left) compared to concentration matched Rabbit (DA1E) mAb IgG XP® Isotype Control #3900 (right). 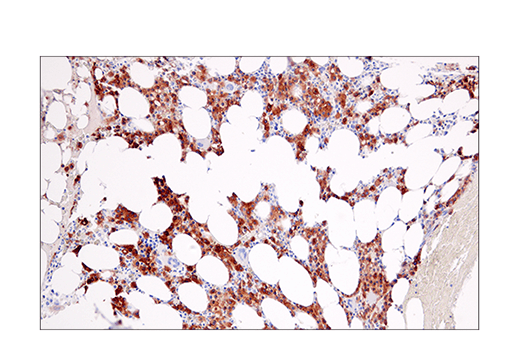 Immunohistochemical analysis of paraffin-embedded human esophageal carcinoma using CRACC/SLAMF7/CD319 (E5C4M) Rabbit mAb. 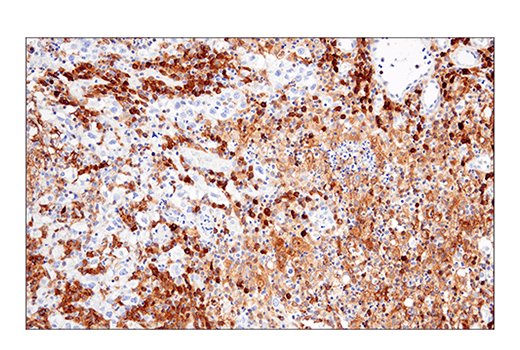 Immunohistochemical analysis of paraffin-embedded human squamous cell lung carcinoma using CRACC/SLAMF7/CD319 (E5C4M) Rabbit mAb. NOTE: Please see product datasheet or product webpage for appropriate antibody dilution^. 3 Peroxide Block Refine Detection Kit Peroxide Block* 5 min. WASH BOND™ Wash Solution 3x 0:00 min. 4 Protein Block (optional) #5425 NGS or #15019 Animal-Free Blocking Solution 20 min. 5 Primary Antibody^ Dilute in #8112 SignalStain® Antibody Diluent 30 min. WASH BOND™ Wash Solution 3x 2:00 min. 6 Secondary Detection Refine Detection Kit Polymer* 10 min. 7a Visualization Refine Detection Kit Mixed DAB Refine* 0:00 min. 7b Visualization Refine Detection Kit Mixed DAB Refine* 10 min. WASH Deionized Water 3x 0:00 min. 8 Counterstain Refine Detection Kit Hematoxylin* 5 min. WASH Deionized Water 0:00 min. WASH BOND™ Wash Solution 0:00 min. LEICA® is a registered trademark of Leica Microsystems IR GmbH. BOND™ is a trademark of Leica Biosystems Melbourne Pty. Ltd. No affiliation or sponsorship between CST and Leica Microsystems IR GmbH or Leica Biosystems Melbourne Pty. Ltd is implied. 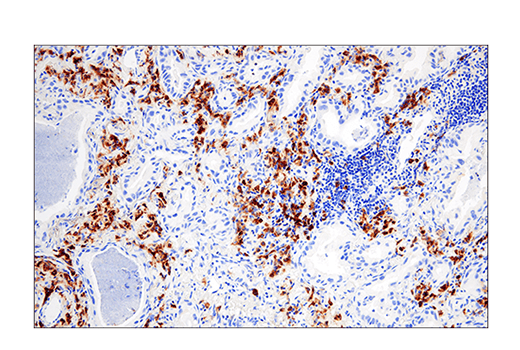 CRACC/SLAMF7/CD319 (E5C4M) Rabbit mAb recognizes endogenous levels of total CRACC/SLAMF7/CD319 protein. 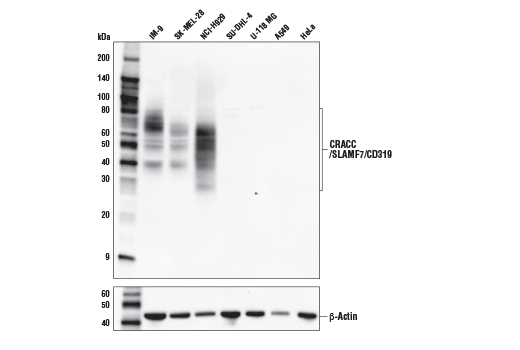 This antibody may cross-react with several isoforms of CRACC/SLAMF7/CD319 and with varying levels of glycosylation. Non-specific staining was observed in prostate epithelium. Monoclonal antibody is produced by immunizing animals with recombinant protein specific to the amino terminus of human CRACC/SLAMF7/CD319 protein. CRACC/SLAMF7/CD319 (also known as CS1) is a member of the signaling lymphocytic activation molecule (SLAM) family. It is a single-pass type l transmembrane glycoprotein expressed on NK cells, subsets of mature dendritic cells, activated B and T lymphocytes, but not in promyelocytic B or T cell lines. Expression of this protein has been detected in the spleen, lymph node, peripheral blood leukocytes, bone marrow, small intestine, stomach, appendix, lung, and trachea (1-6). Homophilic interactions of CRACC/SLAMF7/CD319 modulate the activity and differentiation of immune cells. CRACC/SLAMF7/CD319 may function as an inhibitory or activating receptor in immune cells depending on cellular context and availability of adapter proteins, SH2D1A/SAP and/or SH2D1B/EAT-2 (5-9). In the presence of SH2D1B/EAT-2, CRACC/SLAMF7/CD319 activates NK cells and B cells (5-7). T cells lack SH2D1B/EAT-2 expression, and therefore CRACC/SLAMF7/CD319 acts as an inhibitory receptor (8). In LPS-activated monocytes, CRACC/SLAMF7/CD319 negatively regulates production of proinflammatory cytokines (9). CRACC/SLAMF7/CD319 is upregulated in multiple myeloma and is implicated in the uncontrolled proliferation of these cells, and thus has become the target for therapeutic intervention (10, 11). Seven isoforms of CRACC/SLAMF7/CD319 produced by alternative splicing have been identified. Boles, K.S. and Mathew, P.A. (2001) Immunogenetics 52, 302-7. Tovar, V. et al. (2002) Immunogenetics 54, 394-402. Murphy, J.J. et al. (2002) Biochem J 361, 431-6. Bouchon, A. et al. (2001) J Immunol 167, 5517-21. Kumaresan, P.R. et al. (2002) Mol Immunol 39, 1-8. Lee, J.K. et al. (2007) J Immunol 179, 4672-8. Cruz-Munoz, M.E. et al. (2009) Nat Immunol 10, 297-305. Kim, J.R. et al. (2013) Inflamm Res 62, 765-72. Tai, Y.T. et al. (2008) Blood 112, 1329-37. Hsi, E.D. et al. (2008) Clin Cancer Res 14, 2775-84. BOND is a trademark of Leica Biosystems Melbourne Pty. Ltd. No affiliation or sponsorship between CST and Leica Microsystems IR GmbH or Leica Biosystems Melbourne Pty. Ltd is implied. LEICA is a registered trade​mark of Leica Microsystems IR GmbH.